The Direct-Drive Glycol / TEG Pump™ (model:330-240711P) is a Glycol TEG Pump™ and features a brushed DC motor, differential temperature controller (optional), and a standard size pump head (model: TP330). Flow rates range from 2.0 liters/minute (0.5US GPM) to 12 L/m (3.2US GPM). Available in 12 & 24 VDC configuration. 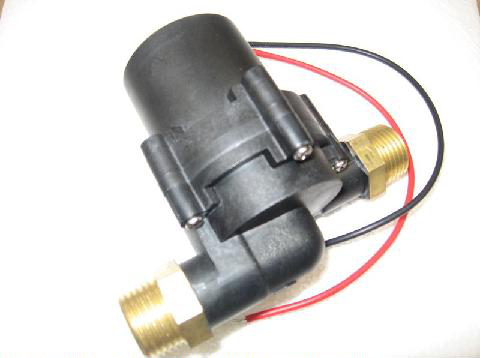 The pump is a brass body, vane-type, positive displacement pump. The pump has special clearances and seals for high temperature protection up to 100°C. Depending on which TEG Pump™ model, the pump has either 3/8″ or 1/2” FPT inlet and outlet ports, and comes equipped with standard compression fittings for 3/8″ OD tube (9.40 mm OD) or 1/2” OD tube (12.7 mm OD). Should your application require fittings or hoses of a different size, metric or imperial, substitutions are possible. Please contact us for more information. The TEG Pump™ is engineered for long life and super-efficient operation to enable you to use the lowest possible power TEG Generator. No parts are subject to corrosion – all wetted parts are stainless steel, brass or carbon. Each TEG Pump™ is backed by a 1-year limited warranty. The TEG Pump™ is a positive displacement pump, which means there is no waste of time or money on equipment to purge air from the circulation loop. It is also self-priming, with a maximum suction lift of 2 meters (6 feet). Liquid, a heavy-duty, large-diameter armature with thick copper windings is used, thus reducing parasitic power consumption by the motor. The result is amazing! – Even in very weak power the motor produces enough power to soft start the pump, power that is produced in the “greenest” of all possible methods.When used with the IPOWERTOWER IITEG scavenger Generator.